Join us for a magical evening at IPO’s 41st Anniversary Gala celebrating all of IPO’s achievements to date—from our beginnings as an innovative volunteer community orchestra to our transformation as a leader of excellence in arts engagement and live classical music performances. Proceeds to benefit the artistic and education programs of the IPO. 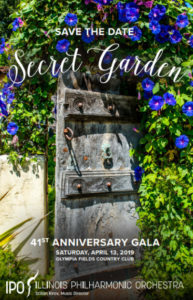 The Secret Garden Gala Auction website is now live. Get a jump start on bidding before the gala begins!